The first thing you hear from the guides on arrival at AÏT BENHADDOU, 190km from Marrakesh and just 34km from Ouarzazate, is a list of its film credits. Though this is a feature of much of the Moroccan south, the Benhaddou ksar has a definite edge over the competition. Lawrence of Arabia was filmed here, of course; Orson Welles used it as a location for Sodom and Gomorrah; and for Jesus of Nazareth the whole lower part of the village was rebuilt. In recent years, more controlled restoration has been carried out under UNESCO auspices, while film crews have been involved in some “re-modelling”. With its souvenir shops and constant stream of tour groups, Aït Benhaddou is not really the place to catch a glimpse of fading ksar life, but it is one of the most spectacular sights of the Atlas, piled upon a low hillock above a shallow, reed-strewn river. Its buildings are among the most elaborately decorated and best preserved in the south; they are less fortified than is usually the case along the Drâa or the Dadès, but, towered and crenellated, and with high, sheer walls of dark red pisé, they must have been near impregnable in this remote, hillside site. 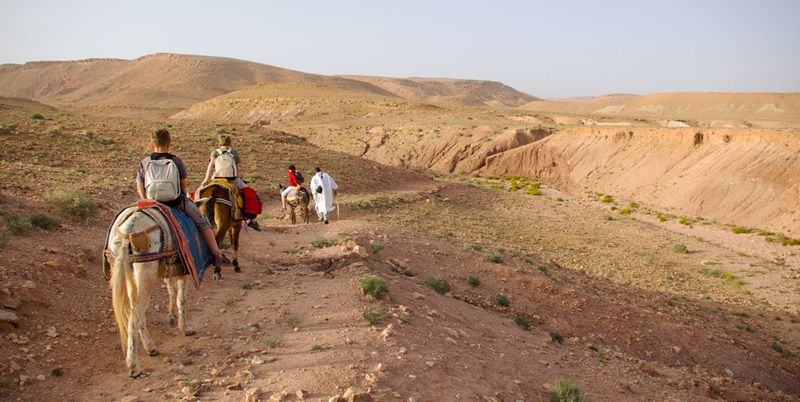 The Ounila Valley: walking the back road to Aït Benhaddou. As hard as it is to imagine today, the tranquil Ounila Valley, set amid high, parched hillsides and edged in by remarkably coloured scree slopes, served as the main route over the Atlas until the French constructed the Tizi n’Tichka to the west. Despite finally being paved in 2011, the road (the P1506) sees relatively little traffic and makes for a fine two-day walk, following the Oued Ounila as it snakes south to Aït Benhaddou. The scattered communities here make abundant use of the narrow but fertile valley, which slowy unveils a wealth of dark red and crumbling kasbahs and agadirs, cliff dwellings, terraced orchards and olive trees – and everywhere children calling to each other from the fields, the river or the roadside. The first stop, after 12km, is Anemiter (2hr 30min walk from Telouet), one of the best-preserved fortified villages in Morocco and well worth a visit, even if you go no further. Leaving the village, the main track clings to the valley side, alternately climbing and descending, but with a general downhill trend as you make your way south. After 3km, you cross a sturdy bridge, beyond which the road follows the left bank of the river to the hamlet of Assako (2hr 30min from Anemiter), where it climbs to the left round some spectacular gorges before dropping steeply; walkers should aim to get beyond this exposed high ground before camping. The trail passes the little village of Tourhat (around 3hr 30min from Assako) before bringing you to Tamdaght (another 3hr), a scattered collection of buildings with a classic kasbah. 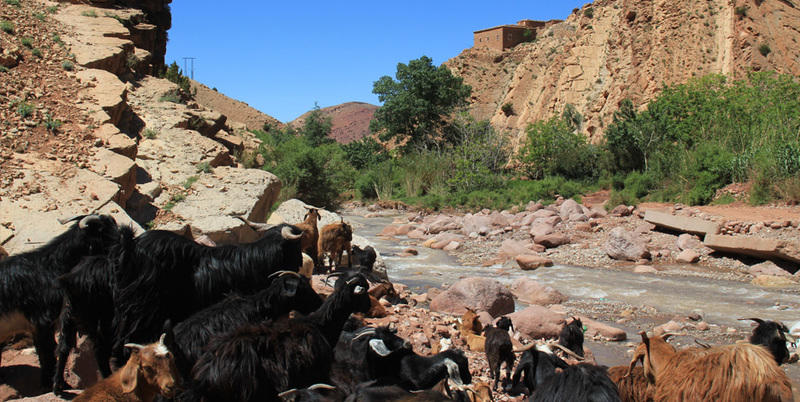 Just 6km from Tamdaght (1hr 15min), along a lush river valley, lies Aït Benhaddou. 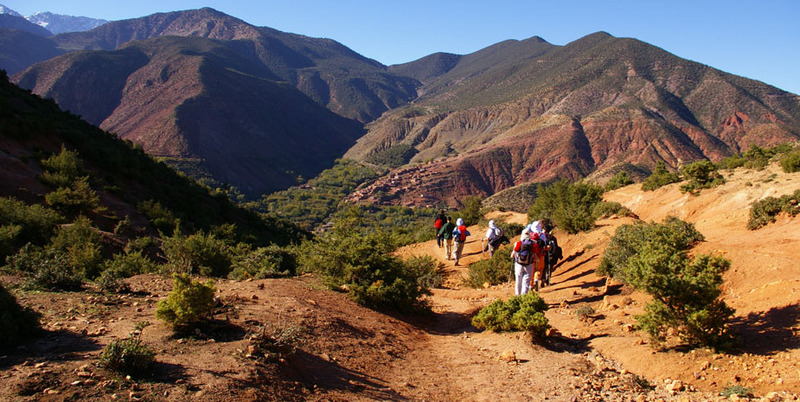 We propose to our customers to organize their custom trekking around Aït Benhaddou and especially in the valley Ounila. All our rates include a guide and a picnic.